Nuclear power is currently used in Argentina and Brazil. 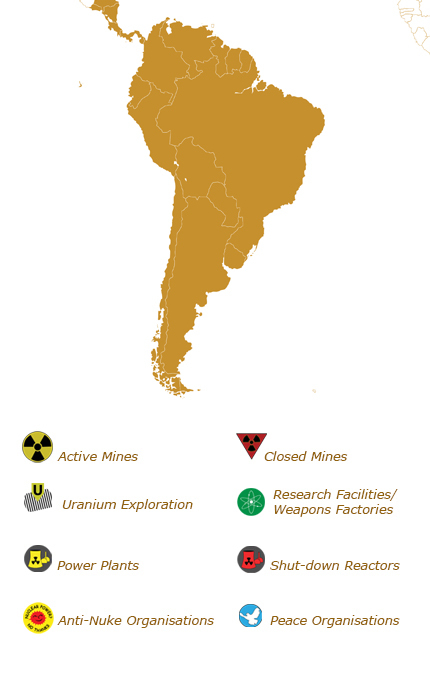 This country is the only uranium producer in South America and it consumes all of its uranium output, while Argentina is advancing its state-owned Cerro Solo deposit towards production. For now, it imports all of its supply from Canada. The largest uranium deposit in South America is Brazil’s Lagoa Real, from which the State produces sufficient yellow element to feed its two nuclear reactors. Brazil has two nuclear reactors generating 3% of its electricity, and a third under construction. The country gets with nuclear power 2.9 percent of its electricity in 2014 (down from a maximum of 4.3 percent in 2001). As early as 1970, the first contract for the construction of a nuclear power plant, Angra-1, was awarded to Westinghouse. The reactor went critical in 1981. In 1975, Brazil signed with Germany what remains probably the largest single contract in the history of the world nuclear industry for the construction of eight 1.3 GW reactors over a 15-year period. However, due to an ever-increasing debt burden and obvious interest in nuclear weapons by the Brazilian military, practically the entire program was abandoned. Only the first reactor, Angra-2, was finally connected to the grid in July 2000, 24 years after construction started. The construction of Angra-3 was started in 1984 but abandoned in June 1991. However, in May 2010, Brazil’s Nuclear Energy Commission issued a construction license and the IAEA noted that a “new” construction started on 1 June 2010. Commissioning was previously planned for July 2016 but has been recently delayed to May 2018. Argentina has three nuclear reactors generating about one-tenth of its electricity. Its first commercial nuclear power reactor began operating in 1974. Construction has started on a small locally-designed power reactor prototype, CAREM-25. In February 2014, Argentina’s National Atomic Energy Commission (CNEA) started construction of the CAREM-25 reactor. SMR enthusiasts around the world welcomed the event. CAREM is a pressurized water reactor with a gross electrical output of 27 MWe. Like other reactors around the world, CAREM has been significantly delayed. The reactor has been in development since the 1980s with an original design output of 15 MWe. Construction of the reactor was scheduled to begin in 2001. By 2009, CAREM developers promised that “preparation of the site facilities” was going well enough “to start the construction during the second half of 2010” and that was “expected to be finished by the end of 2014”. When construction started, CNEA announced that the reactor is currently scheduled to begin cold testing in 2016 and receive its first fuel load in the second half of 2017. The reactor has not received authorization from the country’s regulator for the various forthcoming steps, including fuel loading.